We have been serving this community for years and over the years we have grown to literally become part of the extended family of folks all throughout the city. Small families starting their lives together, to older couples who have lived a lifetime together, we have had the privilege to experience so many of the exciting times our patients have experienced over the years. With that said, we recognize that when someone is initially venturing out to find a new dentist in Trenton that it can sometimes be a bit more confusing that you might initially imagine. Listen, this is a person who is going to be poking around in your mouth, curing your toothache, providing teeth whitening, and other dental procedures for years to come. You need to like the person! So, this is, without question, the most important element of your checklist. Is the dentist someone that you can get along with and trust with complete confidence that they will provide the absolute best oral healthcare possible? If you can answer that question with a sense of confidence, you are well on your way to finding your next dentist! Where are they located? Are they in a remote area of the city that is hard to find? Are they on the 4th floor of a 4 floor building without an elevator? Is the only parking that is available 3 blocks from the clinic in a parking garage that charges $20 per hour? While these are things that you might be able to live with once, perhaps twice… it will get old fast. Your new dental office needs to be easy to get to and extremely accessible. When is the new dental office open? What area the hours of operation? You need to take into consideration all of your family members schedules and see how this coordinates with the dentists that you are considering. There needs to be a fit of schedules. What about education? Are members of the team well-educated and do they participate in ongoing continued training? If you require a form of dental implants, do they have the specialized training to ensure a relatively pain-free experience? Are they trained in cosmetic dentistry in order to apply those great new porcelain veneers you are looking forward to? What about state certifications? Have they passed their boards? This is easy enough to find out, more often than not, simply by asking. How does the clinic approach preventive dental care? Are they proactive in their education of their patients? Do they set out a clear path for oral healthcare? If you are anticipating a surgical procedure, is the dental candidate certified to execute the procedure? How does the dental office handle emergencies? Seeking an emergency dentist is not always easy, especially when you need one. (We’ll outline our approach to emergencies below). What insurance network does the clinic belong to? Is your insurance going to be accepted with this new dentist? What about missed appointments? How are they managed by the office manager? Are you charged a certain amount and is there a reschedule fee? How did you feel when you left the office? Did the staff make you feel comfortable and confident that they not only fully knew what they were doing, but they would act in your best interests, always? Are you looking for someone who also serves as a pediatric dentist? How did your child feel about this person? Were you there to discuss being fitted for a new set of affordable dentures? Did the process go smooth and was it conducted in a professional manner? Did they operate in an organized manner or did things seem a bit chaotic? Were things maintained in a clean and sterile environment? Could you tell that the entire staff took cleanliness seriously? Did you discuss payment policies? If you have been diagnosed with a gum disease like gingivitis, did someone on the team outline the potential costs that will be involved? Were any alternative payment terms discussed? You see, when you are able to get these issues outlined and addressed, it makes finding a dentist in Trenton much easier than you may have originally thought. As previously mentioned, we have been serving the community for many years. During this time, one of the things that we have a tremendous pride in is the amount of referrals we receive from existing patients. What this tells us is that we are doing something right. We care for each and every patient as if they are the only patient on the planet. We work to ensure we have a coordinated plan to provide the best oral healthcare possible. With a combination of preventive dentistry processes and a proactive attack plan for any type of restorative procedures that may become necessary, our patient’s best interests are top-of-mind. 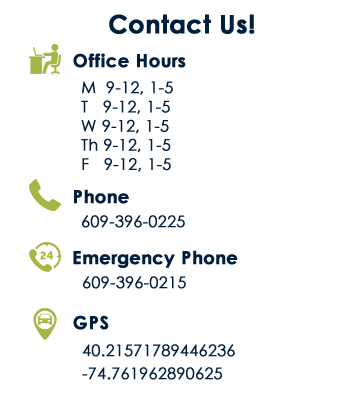 When it comes to emergencies, while we may not always be available, you will always have a number to call. We have coordinated with several other dentists in the area, creating a bit of our own network of sorts to ensure that patients are taken care of. As far as the other checklist items, we strongly encourage you to take a few minutes, schedule your initial consultation and come down to our office. We are extremely well located and convenient. So, call us or fill out the form on this page and we’ll sit down and walk through a long-term plan.